Lush Bubble Bars and Bath Bombs: the ultimate bath-reading accessories? A lot of people love nothing better than a cup of tea, a book and a bath. 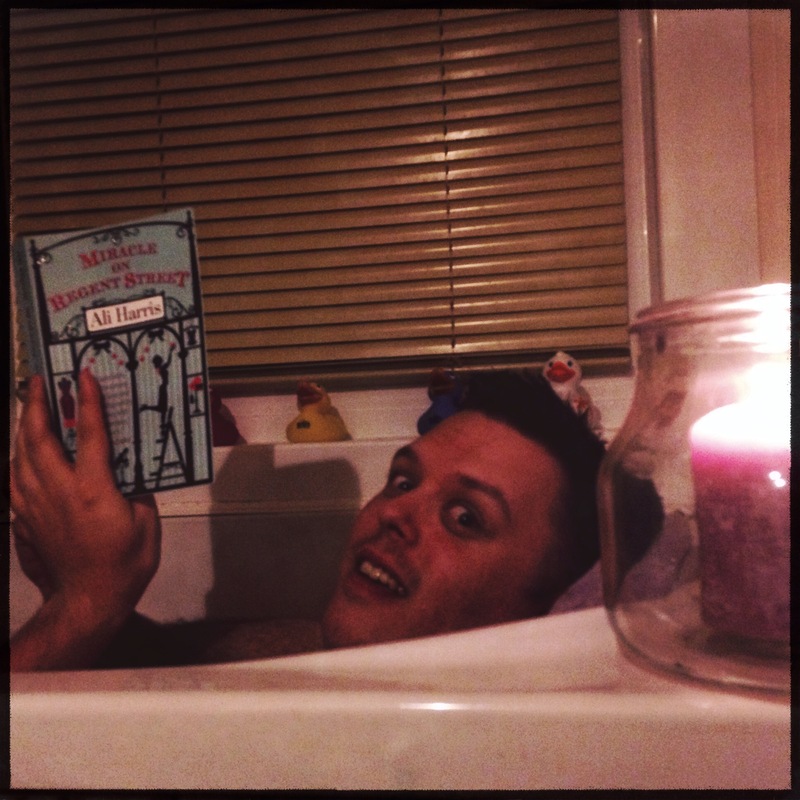 I must admit that in the past I’ve always been more of a showers girl, but now I’m embracing the joy of reading in the bath under Rob’s expert tuition. Of course, any bath should be a real treat, so here are some recommendations for relaxing and luxurious bath products from Lush to make your bath-reading complete. Lush produce a number of bath products, but I particularly like their Bubble Bars (solid bath bubbles that you crumble into the running water – about 1/3 per bath), Bath Bombs (drop into a full bath, it’ll fizz but tends not to leave bubbles), and Shower Gels (which can be squeezed into the running water and bubble up, as well as used in the shower). Here’s my collection of current favourites! L to R: Karma Bubble Bar, The Comforter Bubble Bar, Sparkly Pumpkin Bubble Bar, Amandopondo Bubble Bar and May Day Bath Bomb. Bottles: Rose Jam and Hot Toddy Shower Gel. The Karma Bubble Bar has a distinctive scent, full of orange and patchouli so it’s spicy but also bright and uplifting. The bar turns the water a brilliant orange colour, there’s also lavender and pine in there – you’ll get out of your soak relaxed and ready for the rest of the day. The Comforter Bubble Bar is one for an evening bath before bed. It has a lovely warming fragrance, full of blackcurrant and bergamot natural oils. This is perfect for unwinding after a long day, especially when it’s wintry outside. Plus, it looks like you’ve got a bath of hot Ribena! The Sparkly Pumpkin Bubble Bar is a limited edition product for Halloween. I’m a big fan of the profusion of sparkly products for AW2014. I asked the (fantastically helpful and friendly) shop assistant at Lush Colchester about this, and she explained that it’s because the glitter is now all biodegradable – it’s made of Agar, derived from seaweed – so they’ve gone glitter-crazy! Lush say this contains oils of juniper berry, lime and grapefruit, but it smells lovely and spicy to me, very festive. Is this the bath equivalent of a Pumpkin Spiced Latte? I think so! The Amandopondo Bubble Bar has one of my favourite scents and oils of all, Rose Absolute, as well as orange and lemon oils. This means it has a sweet and delicate rose fragrance, as well as uplifting citrus notes, and it’s also great for your skin. I wish I could just smell like this all the time, it’s beautiful. The May Day Bath Bomb has a light, fresh scent with a hint of sweetness and a bit of citrus too – I’m afraid I can’t tell you exactly what’s in it (apart from that I really like it) because this was another Limited Edition product linked to Lush’s campaign against the badger cull, earlier in 2014. I still have three of these left (I bought two and then my mum bought me the others) because I like the smell and wanted to support the campaign. If you click the link above, it’ll take you to a page with more information about the campaign. I’ve included two shower gels, as, although they’re not designed for it, they work brilliantly as bath bubbles – and they’re both Limited Edition Christmas products! I discovered Rose Jam Shower Gel last year around Christmas time and completely fell in love with it. It contains the amazingly luxurious mixture of Argan oil, Rose Absolute, rose oil, lemon oil and vanilla infusion so it’s wonderful on the skin and smells delicious. After a shower or bath with this, I can be found sniffing my own arm appreciatively – I’m not kidding. It’s not too sweet because of the lemon oil, but it does remind me a little of Turkish Delight! My final pick here is Hot Toddy Shower Gel. This is pretty much Christmas in a bottle – it’s bright red with gold sparkles, and is packed with all the classic Christmas spices – ginger, cloves, cinnamon plus bergamot, lemon, orange and seaweed extract to moisturise. This is quite a masculine, strong fragrance but is more delicate on the skin afterwards. Team this with a festive story and a mug of mulled wine and I don’t think you could get more into the spirit of the season. I must remember to stock up on this, and Rose Jam, before they stop making them again in the New Year. What are you favourite bath-reading accessories? Have you ever tried Lush products – what were your likes and dislikes? We’d love to know! All products featured in this post were bought by myself or received as gifts, purchased from Lush. Next PostNext Podcast: What Makes A Good Book Review?